The Golden Oak Inn Bed & Breakfast was originally built in 1901 for the prominent Van Dyne family. The original hardwood staircase and woodwork throughout the grand Victorian residence will take your breath away. The lavishly decorated dining room stenciling, which is also original to the house, was later painstakingly embellished in gold. Antiques tastefully enhance the alluring atmosphere. Over the years, the home has been updated to include all the modern amenities you would expect in a home, but still maintaining the original integrity and charm. Take a walk back in time as you view the ornate architecture both inside and out. The Golden Oak Inn is conveniently located two blocks south of the center of Troy. Troy is a quaint town with many shops and restaurants within walking distance. Dine in style with candlelight and soft music. The 3 course breakfast served on fine antique china is one of the many highlights of our guests’ stay at The Golden Oak Inn Bed & Breakfast. Relaxing is a must when staying at The Golden Oak Inn. We offer a quiet environment, a comfortable bed with premium quality bedding, lots of plush fluffy pillows, and a number of amenities. One off-street parking space is available for each guest room. 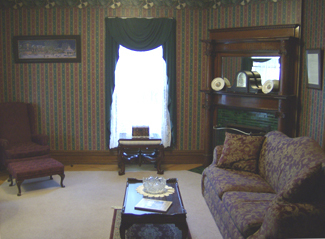 The Lincoln, Pennsylvania and South rooms each have a DVD player in the room. You can bring your own DVDs from home or check one out from our over 500 DVD library collection. Read a magazine or newspaper in the men’s parlor, or just sit back, relax, and read a book on the cushioned bay window seating bench in the library. 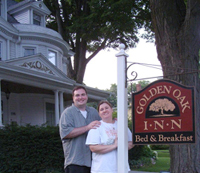 The Golden Oak Inn Bed & Breakfast has been a bed and breakfast for over 25 years and is the longest running bed and breakfast in Troy, Pennsylvania and the surrounding area. Previously, it was known as The Silver Oak Leaf Bed and Breakfast. Will Hawrylo has been the proud owner of The Golden Oak Inn since January 2008. The number one goal is to provide each of our guests with a clean, safe, and comfortable environment while staying at the Inn. As your innkeeper lives on the premises, he provides the utmost in care and hospitality for each guest. He also has his own living quarters which allows guests the feeling of their own space and privacy. Will has approximately 6 years of prior experience in a commercial bakery and is also a culinary school trained chef. He trained in nutrition within the culinary arts and applies the fundamentals he learned into creating well-balanced meals. He uses fresh high-quality ingredients procured from local produce farms and other local businesses when available. Will enjoys picking seasonal fruits from the local orchards and berry farms. Will spends time caring for award-winning flowers, herbs, and plants in both the garden and greenhouse. When in season, the fragrant flowers are placed around the Inn in decorative vases and the fresh herbs are used in some of the morning breakfast preparations. Originally built in 1901 for the prominent Van Dyne family. The original hardwood staircase and woodwork throughout the grand Victorian residence will take your breath away. The lavishly decorated dining room stenciling, which is also original to the house, was later painstakingly embellished in gold. Antiques tastefully enhance the alluring atmosphere. Over the years, the home has been updated to include all the modern amenities you would expect in a home, but still maintaining the original integrity and charm.